I like to take pictures of baseball games (and sometimes other stuff). More than that, I like sharing pictures from baseball games. As it says on my photography page, anyone is welcome to use my pictures for blogs or whatever, as long as I’m properly credited. I also like to see how people are using my stuff, so if you think of it, shoot me an e-mail when you use one of my photos. If you need the full-res version for any reason, just ask and I”ll send it along! 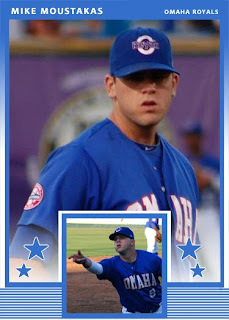 This week, Dave from Goose Joak made two custom baseball cards using my pictures – one of Kurt Mertins, and one of Mike Moustakas. That’s a pretty cool site – check it out! Again: Sharing is good, with credit. Feel free to follow Dave’s lead! I’ll be sprucing up the Photography page soon so it’s a little easier to see some actual photos, rather than a textual list. What would YOU like to see on that page? Thanks for the shout out! 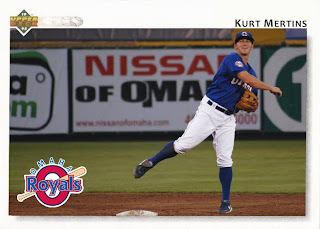 You have (by far) the best collection of O-Royals pictures around. I’d wanted to do an entire set of them this year but only recently stumbled upon your site (by way of Royals Review). As I have the time I’d love to make some more. Thanks so much! The photography is just a hobby on my days off from working for the team, but I’m proud of a lot of these photos. I’d love to see you keep using them, because I LOVE your work too! Cool blog by the way! Enjoyable reads as I’ve gone back through it.